If you want to understand the nature of Pringles and other stackable chips, you can forget idea that they are made from actual potatoes in any recognizable way. 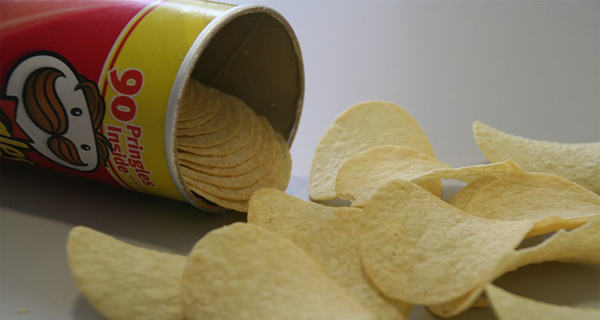 The Pringles Company (in an effort to avoid taxes levied against “luxury foods” like chips in the UK) once even stated that the content of potatoes in their chips was so small that they are technically not even a potato chips. So what are they exactly made of? The process starts with a slurry of rice, potato flakes, wheat and corn which are pressed into shape. This dough-like substance is then rolled out into an ultra-thin sheet cut into thin chip-cookies by a machine. “The chips move forward on a conveyor belt where they’re pressed onto molds, that gives them the curve that helps them fit into one another. Those molds move through boiling oil … Then are blown dried, sprayed with the powdered flavors, and at last, placed onto a slower-moving conveyor belt specially made allowing them to stack. I think that mostly everyone reading this, enjoys the taste of potato chips. However, one thing is clear, they are one of the most toxic processed foods you can eat— it doesn’t matter if they are made from actual potato shavings or not. Potato Chips are Loaded with Cancer-Causing Chemicals. One of the most hazardous ingredients in potato chips are not intentionally added, but rather are a byproduct of the processing. A cancer-causing and potentially neurotoxic chemical, Acrylamide, is created when carbohydrate-rich foods are cooked at high temperatures, whether fried, baked, toasted or roasted. Some of the worst offenders include French fries and potato chips, but many foods cooked or processed at temperatures above 212°F (100°C) are likely to contain acrylamide. The main rule is: the chemical is formed when the food is heated enough to produce a fairly dry and yellow/brown surface. Grains: toast,bread crust, roasted breakfast cereals, crisp bread and various processed snacks. Coffee: ground coffee powder and roasted coffee beans. Surprisingly, substitutes for coffee based on chicory actually contain 2-3 times MORE acrylamide than real coffee. The federal limit for acrylamide in drinking water is 0.12 micrograms in an eight-ounce glass of water, or about 0.5 parts per billion. However, a six-ounce serving of French fries can contain 60 micrograms of acrylamide, or nearly FIVE HUNDRED times over the federal limit. The potato chips have a notoriously high amountof this dangerous chemical. So high, in fact, that in 2005 the state of California sued the potato chips makers for failing to warn the consumers from California about the health risks of acrylamide found in their products. was reached in 2008 when Frito-Lay and few other potato chip makers agreed to reduce the acrylamide levels in their chips to 275 parts per billion (ppb) by 2011, which is the amount low enough to avoid the cancer warning label. Levels of Cancer-Causing Acrylamide in Popular Brands of Potato Chips,” issued by the California-based environmental Law Foundation (ELF), warned about the dangers of this popular snack. Caution: Baked Chips May Be Even WorseThan Fried! If you think that you can evade the health risks of the potato chips by choosing its baked varieties, which are always advertised as being “healthier”,well think again.One thing you have to remember is that acrylamide is formed not only when foods are boiled or fried, but also when they are baked. And according to U.S. Food and Drug Administration (FDA) data on amounts of acrylamide in foods, baked chips may contain more than three timesthe amount of acrylamide from regular chips! Interestingly, the same thing goes for other foods, too, which suggests that baking the potatoes at high temperatures may be one of the worst ways to process them. For example, according to the FDA’s data, Ore Ida Golden Fries contained 107 ppb of acrylamide in the regular fried version and 1,098 in the baked one. So remember this, ALL potato chips contain acrylamide, regardless of whether they arefried or baked; natural or not. Likewise, they will ALL affect your insulin levels in a very negative way. When foods are heated to high temperatures, Acrylamide is not the only dangerous genotoxic compound that is formed. A three-year long EU project, known as Heat–Generated Food Toxicants (HEATOX), whose findings were published at the end of 2007, found that there are more than 800 heat–induced compounds, of which 52 are potential carcinogens. In addition to their discoveriesis that acrylamide does pose a public health threat, the HEATOX scientists also discovered that you’re far less likely to ingest dangerous levels of the toxin when you eat homecooked foods compared to the restaurant or industrially-prepared foods. Additionally, the HEATOX findings also suggest that although there are ways to decrease exposure to acrylamide, it can never be eliminated completely. They have calculated that, with a successful application of all known methods until todayit would reduce the acrylamide intake by 40 percent at the most—which makes us wonder whether chips manufacturers have been successful in reducing acrylamide levels to within federal limits… There’s no updated data yet, so there’s no proofthat they’ve been able to comply with the 2005 agreement. For more detailed information about acrylamide, we recommend reading the online report Heat– Generated Food Toxicants, Identification, Characterization and Risk Minimization. However, in general, just remember that cooking food at high temperatures is not advised. Advanced Glycation End Products (AGEs): When the food is cooked at high temperatures (including when it is sterilized or pasteurized), the formation of AGEs in your food increases. When you consume the food, it transfers the AGEs into your body. AGEs build up in your body over time leading to inflammation, oxidative stress, and an increased risk of heart disease, kidney disease and diabetes. Heterocyclic Amines (HCAs): These HCAs are formed when the meat is cooked at high temperatures, and they’re also linked to cancer. In terms of HCA, the worst part of the meat is the section where the meat has blackened, which is why you should always avoid charring your meat, and never eat the blackened sections. Polycyclic Aromatic Hydrocarbons (PAHs): When fat drips onto the heat source, causing excess smoke, and the smoke surrounds your food, it can transfer cancer-causing PAHs to be created in the meat. The search for a Healthy chips is like a modern-day search for the Holy Grail, but chip manufacturers keep searching for methods to improve the image of their health-harming but very profitable snacks. For example, by the end of 2011, about half of Pepsi’s Frito-Lay brand snacks were reformulated with all-natural ingredients. The change is part of PepsiCo’s master plan to step into the healthy foods market share. The Wall Street Journal recently revealed that the company hopes to boost their nutrition business profits from $10 billion to $30 billion by 2020. The dietary hazards like monosodium glutamate (MSG) are going to be removed by the company and should be replaced with natural seasonings, such as paprika and molasses. The beet juice, the purple cabbage and the carrots are going to replace the artificial colors. All in all, about 60different snacks are scheduled to get an all-natural makeover. This is very good example of how consumer demand can change the direction of food manufacturers in a positive way. The reformulated chips might end up being less bad for you than the original formulations. However, chips is never going to be truly healthful. All-natural chips may be the lesser of two evils, but if consumed regularly, they will still push your health in the wrong direction… There’s no escaping from the fact that modern plagues such as heart disease, cancer, diabetes and obesity have a dietary component, and potato chips and French fries will always be theworst choice if you want to avoid becoming another disease statistic. Ideally, you should consume foods that are minimally processed or raw if you want to avoid these types of toxic byproducts—the more raw food, the better. Our nutrition plan obligates you that at least one-third of your foods must be consumed raw. Personally, i consume about 80 percent of the food raw, and I think that this is one of the most important factors that keeps me healthy. It may take you some time to switch over to a less processed diet, but it would be a great start if you throw out the most obvious culprits. potato chips and French fries, all kinds of sodas (both regular and diet, as artificial sweeteners may be more problematic than fructose), Doughnuts. Cooking and processing aside from creating potentially toxic byproducts, also depletes the food of valuable micronutrients, which is another reason for you to consume as much raw food as possible. This includes protein sources such as eggs. Raw whole eggs from organic, pastured chickens are a great source of high-quality nutrients that many are deficient in. Another good example of a food that is beneficial in its raw state israw milk, but it becomes harmful after it is pasteurized. With the search for foods that will benefit your health, such as raw, preferably organic or/andlocally-grown vegetables, organic grass-fed meats, raw dairy, healthy oils, seeds and nuts, you can improve your health greatly. These are the foods that are truly natural, and quite easy to prepare once you get the hang of it. For a step-by-step guide in order to make the transition to a healthier diet as smooth and simple as possible, simply follow the advice in ourimproved nutrition plan. Remember, the “secret” in getting healthier, losing weight and really enjoying your food is eating fresh whole foods. It’s sad that so many people are under the wrong belief that it’s “almost impossible” to create a meal without processed foods. Mark Scarbrough and Bruce Weinstein are fighting with this issue head-on in their book Real Food Has Curves, which is a great starting point to if you want to “relearn” the basics of how to enjoy and prepare real food. Once you get used to it, you’ll find you can prepare yourself a healthy meal from scratch in the same amount of time it would have taken you to go down the street andbuy fast food. The main difference is going to be biggerer satisfaction, both mentally and physically, and even financially, as processed foods are typically more expensive than cooking yourself a healthy meal from scratch.